I love putting bows on my little girl. The bigger the better! When I found out I was having a girl I scoured the internet for the cute boutique bows that I have seen all over. When I found out how much they cost I decided to make them myself. Take the 7/8" ribbons and cut into 5" strips. You want to cut three of each color. Cut the 1 1/2" purple ribbon into 18" inches. Fan out the strips of 5" ribbon alternating colors. Sew a running stitch down the middle. Pull tightly and sew through and wrap around a few times. Sew through one more time and cut and knot thread ends. 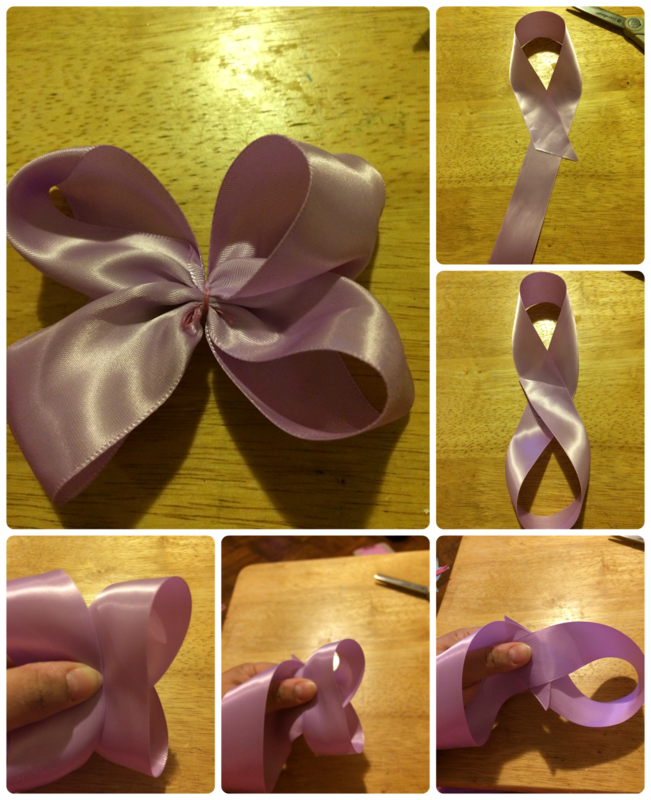 Take 1" purple ribbon and form into figure 8. Bring the top and bottom of the "8" towards the middle and pinch together. Sew the middle, wrap around a few times and then sew through again. Cut and knot the thread ends. Hot glue the purple bow on top of the fanned strips. Cut pink felt into a 2" x 4" inch square. Fold in half and hot glue closed. Cut into an egg shape. 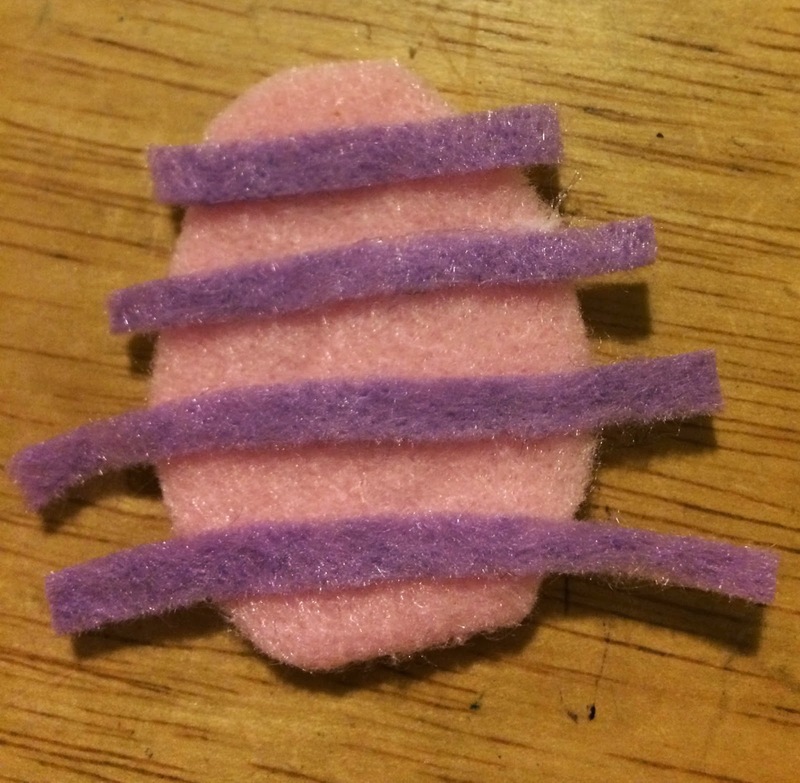 Cut thin strips of purple felt and hot glue to egg. Trim strips from egg. Hot glue to the middle of the bow. 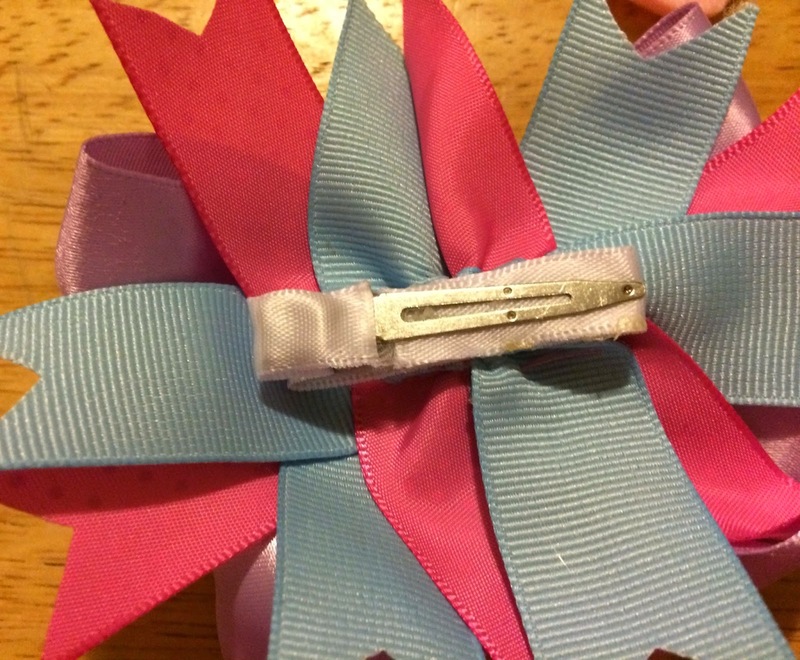 Hot glue white ribbon to clip. Hot glue covered clip to the back of the bow. 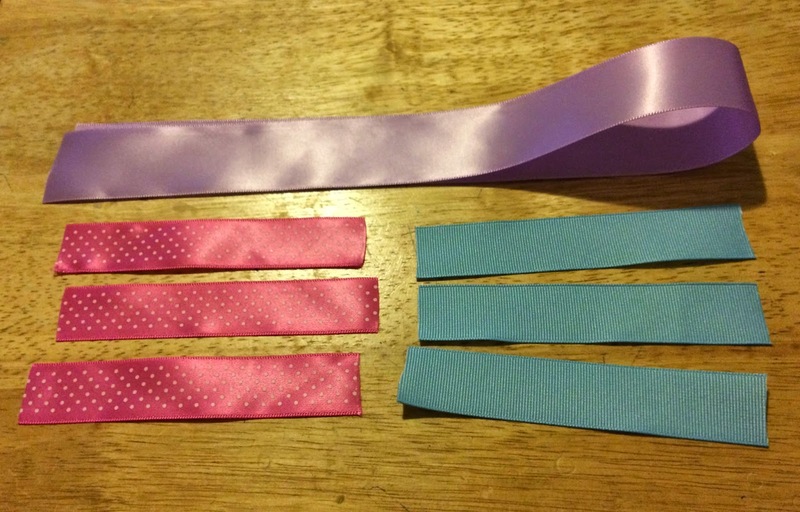 **Tip: To keep ends of ribbon from fraying burn slightly with a lighter. 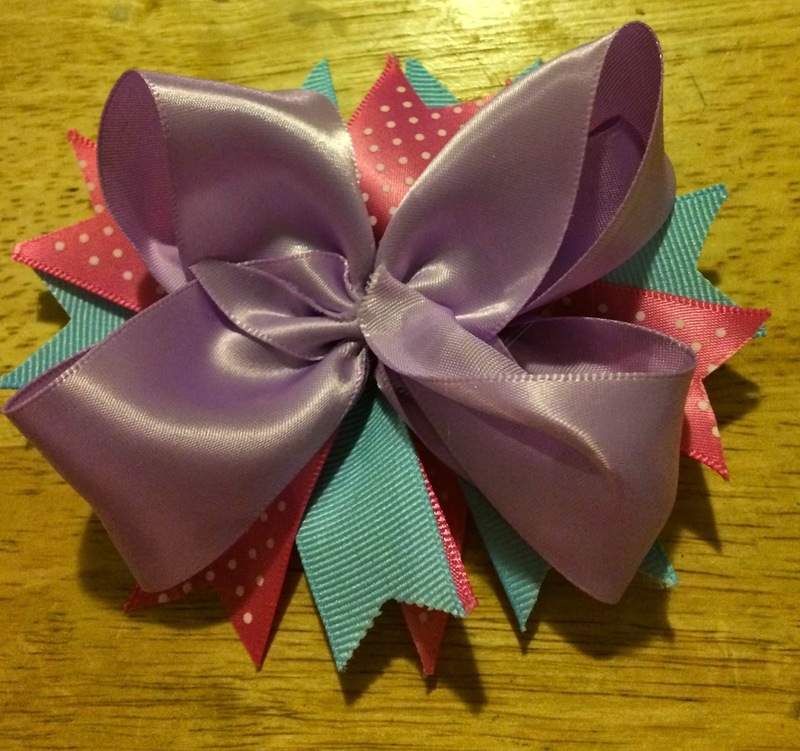 What a cute bow for a little girl! My great niece is still a bit too young but I think I'll ask my Mom (her Great Granny) to make a couple pf bows up for her since I am a major klutz! How neat and easy to do. With my five girls we never have enough bows. Now I can just make them myself. Thank you for sharing. So easy & pretty! Thanks for sharing this with us! Oh so sweet. My girls would love one. Pretty cool, would love something like this for my baby girl! This is so pretty. You did a great job with the step by step photos. That's looks like something I could make. I'm not a sewer but I think I can make these for my granddaughters. What a gorgeous, festive bow! It looks like it's not too hard to do, too, which is always a bonus. I'm not crafty- like, at all. But I think even I could pull this off! 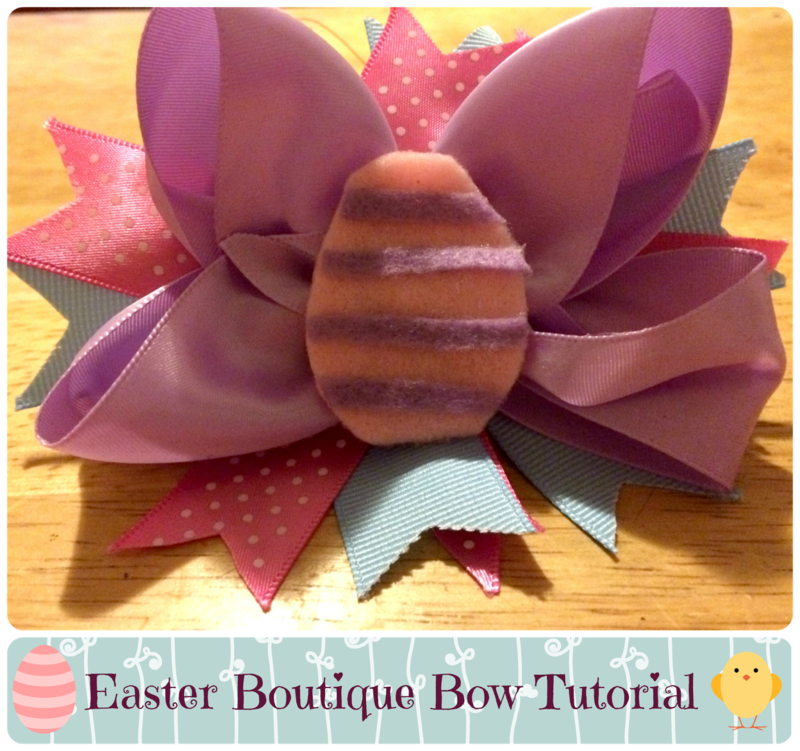 So very cute- love the Easter bow! This is really cute. My daughter would have loved making this with me when she was small. very cute--my daughter used to let me put pretty bows like this in her hair. Oh yeah, I love this post! Things like this are easy if you have someone show you, but they are NOT easy (for me) if you try to do them on your own! Great tutorial! You make it look so much easier than I thought it would be! Oh man, I would love to say that I'm going to try this... I am so not crafty! I marvel at moms like you that can do these sorts of things! And my daughter wishes I could too :) Maybe one day! Happy Easter! This Is Adorable & So Pretty Thank You will Make With The Girls! 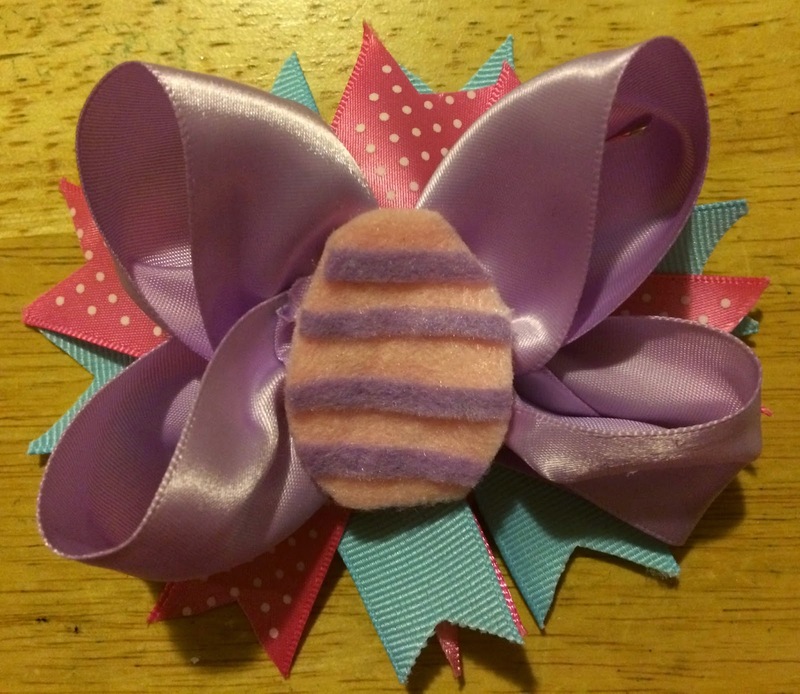 I think my daughters and I would have fun making bows. We can always substitute the egg with beads or butterflies! Thanks for the demo, I think I could now make a bow! What a cute bow. I'm sure any little girl would be proud to wear it.